Human rights activists and researchers from across the world came together at a Writers’ Retreat in Sao Paulo, Brazil to share ideas and strategies for confronting closing civic spaces. SPACES FOR CHANGE participated in the 7-day retreat. 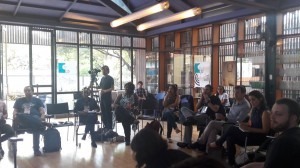 The participants are all working on the issue of reclaiming civic space in their respective countries, and are also contributors to a special edition of the Sur International Journal on Human Rights, published by Conectas with support from the Fund for Global Human Rights. The title of this special edition will be “Reclaiming civic space: Insights and learning from and for activists“. It will be translated into English, Spanish and Portuguese and will reach over 20,000 readers in over 100 countries. The growing restrictions on free speech, association and assembly rights, including the tide of restrictive legislation, have engendered a climate of fear in Nigeria, shrinking the spaces for civic engagement. SPACES FOR CHANGE participated in the 7-day retreat, and shared experiences regarding how Nigerian activists and organizations are using the strategic combination of research action, social media mobilization and cross-border networks to confront closing civic spaces in Nigeria. The array of presentations and reflections from eminent human rights authors, activists, grantmakers, and academics provided deep insights on the root causes of the crackdowns on the civic space, and the diverse strategies for responding to them, including other human rights violations. Speakers at the retreat include Philip Alston, co-author of the International Human Rights in Context, Oliver Hudson and Camila Asano of Conectas, James Savage of the Fund for Global Human Rights, Iva Dobrichima of the Open Society Foundation, and so many others. Writers peer-reviewed the scholarly articles that have been submitted, and also benefited from a number of events taking place in parallel as part of the International Colloquium on Human Rights – a biannual gathering of over 100 human rights activists in São Paulo. The objective of the Sur International Journal on Human Rights, published by Conectas, is to influence the global human rights agenda by producing, fostering and disseminating innovative research and ideas, primarily from the Global South, on human rights practice. Sur is an open access journal, edited in English, Spanish and Portuguese and has an online (sur.conectas.org/en) and print readership of over 20,000 people in more than 100 countries.